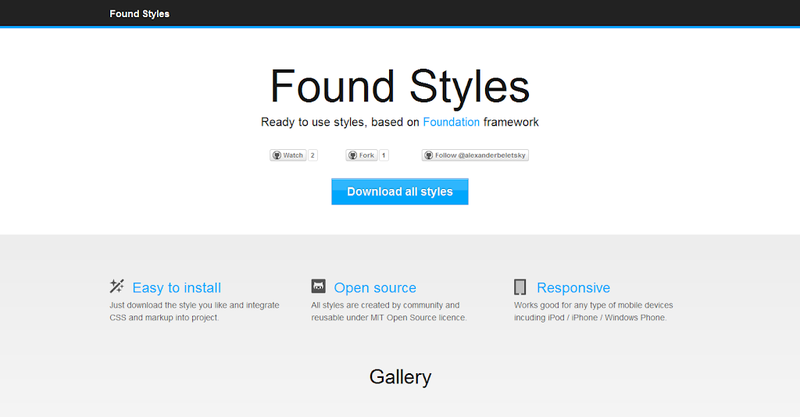 Foundstyles.com is a little project I’ve been working for last week. The idea is very simple. Remember, I blogged about Foundation Framework that works pretty nice for me. So, I’ve decided to do something similar that exist for twitter bootstrap framework - bootswatch ready to pickup .css that could be easily integrated to your site. Today the site is available! Unfortunately Foundation does not support LESS from the package, so I need to move colors and layout into corresponding .LESS files, so after it’s just possible to have a basic template which is possible to customize with own colors. As for now, I’ve created only 3 templates: Blades Of Steel, Evergreen Tree and Coffee and Milk. I had a lot of joy making those styles. Making web designs and playing with colors is my next hobby, I think. Through, those styles are really simple ones, I’m going to add more eventually. Since the project is just hosted on github you are able to push you own styles. If you feel inspired, I would be really happy for submissions. Nearest plans are apply some fixes for IE (both site and styles) and just go ahead and produce some more. Hope it could be useful for you guys.